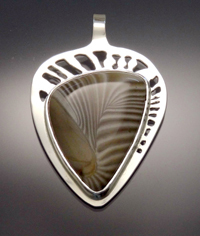 I create jewellery from sterling silver in unique designs that range from the abstract to ones that reflect the natural world by incorporating images of plants, horses or wildlife. 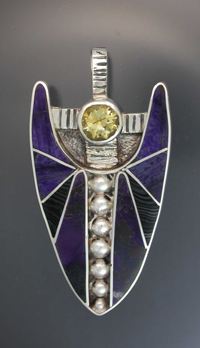 Each piece is one-of-a-kind and individually made from sterling silver sheet and/or wire. 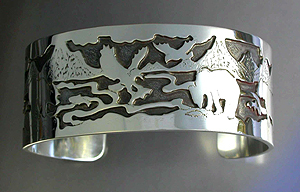 Intricate designs are cut out by hand with a fine saw blade and texture may be added by fusing, reticulation, hammering or engraving. 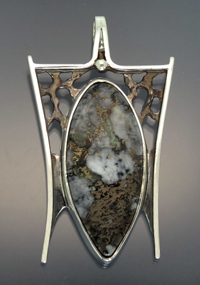 Many pieces are designed around "semi-precious" stones that I shape and polish myself using diamond impregnated saws, grinding and polishing wheels. These stones are often collected by me on field trips all over the world. 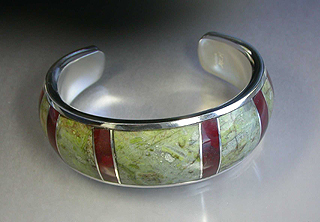 One of my specialities is stone inlay, as seen in the photo of the cuff bracelet inlaid with beach stones from Vancouver Island. In general, my prices range from about $30 for simple silver earrings or rings to about $400 for complex, stone-inlaid, bracelets. Commissions are welcome and although my studio is not open year round, you can contact me anytime by phone or email to see if I have the "special piece" that you are looking for.